Happy Chocolate Friday!! Glad you made it to the end of the week - time for a chocolate break! I have a wonderful guest poster for you today! Jen is a sweet blogger who loves chocolate just as much as I do and often links up her wonderful recipes. You can find her blogging at Many Blessings, Busy Life where she talks about her life as a Christian Stay-at-home mom with 9 children, homeschooling, and whatever comes her way. Is it any surprise that she loves Dr. Pepper, chocolate, and has a great sense of humor?! Hello to all you Chocolate Lovers out there. I am so honored to be guest posting for Lisa. I have been really excited about this post; one because it involves my favorite dessert: chocolate (what else!? 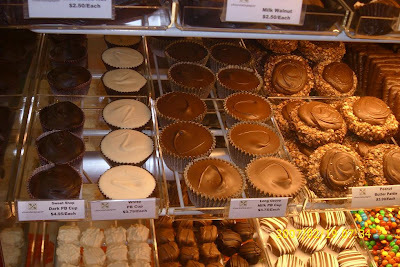 ), and two because it features a store that is ALL about chocolate! Have you ever been to Roanoke, VA? I went there this past weekend. (Which if you read my blog you would know that already). I had a lot of fun. It was a sweet weekend in more ways than one. First, I got to meet a fellow blogger - Hey, Kat!, and second I got to go to this store. Now that you've seen all that yummy goodness, don't you want some of your own? Well, the good news is that even if you don't live near Roanoke, VA you can have some of their chocolate. 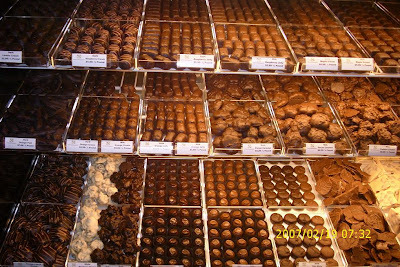 That's right, they have mail order (for some of their chocolate, truffles are local delivery only). Just go to their website and find the ones you want to order. Personally I would not advise ordering while it's hot. You want to get these in the shape they are supposed to be, not oozing all over the place. The only thing they can't send you is the chocolate-y scent that wraps around you when you walk in the store. Aaaahhhh! So if you're ever in Roanoke, VA or even if you're not. 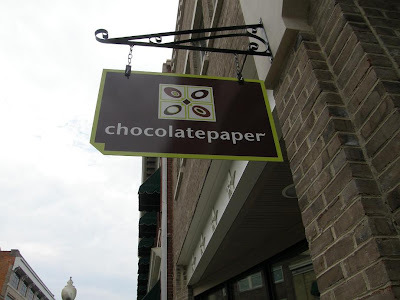 Go by Chocolate Paper and sample some of their chocolate-y goodness. Now it's your turn to share the chocolate! Go find or write a chocolate post and come back to link it up right here below with MckLinky! I'll appreciate it and so will Jen! Have a lovely chocolate-filled day! That looks like a wonderful store! And it was nice to meet you, JenT. I'm a little behind on chocolate posts (it's been a busy summer), but I can't wait to try the baked fudge that was posted last week. It looks delicious!! All that chocolatey goodness all in one place. I believe I just got a glimpse of Heaven! Big I need to do some guests posts sometimes cause it would be a nice break size hugs to you! We have very limited options to chocolate shopping here in NS. There's a Rocky Mountain in the city and various Farmer's Markets have homemade chockies! (But some are only mediocre!) And I adore me some good chocolate .... would climb the highest mountain, cross the ocean blue & all that stuff. Oh, to discover such a place as this would truly be bliss!!! Darn... I posted mine this morning and then forgot to link here till just now. Ok, call me crazy, but I seriously wanted to dive in to those photos. And I'm not ashamed to say it! Oh my gosh!! How yummy is that!!!!!! What a fun guest post to read. I loved the pictures and they seriously made my mouth water. I'm not kidding...lol! Oh, what a wretched person you are to share with us those divine pictures....oh, my mouth is watering!! Oh that sounds yummy! 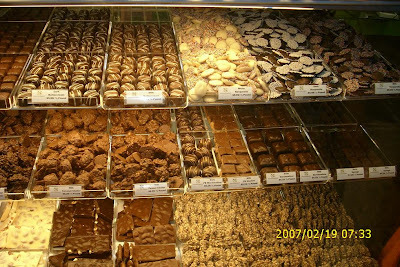 Of course a chocolate store is my favorite type of store ;) I'll have to go check out Jen's blog. She sounds like a great blogger! Oh I am going to confess that I ate 2 pieces of chocolate cake this afternoon. I never do that. But it was so good! I enjoyed every last calorie!